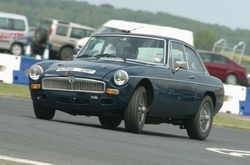 I am pretty certain that my mgb has been used for track days or racing in the past during a 10 year period 2004 – 2014. During the period 2004-2014 the car was sorned off road yet covered nearly 2000 miles? This period the car had 2 owners IR then ML both of Peterborough but cannot find any record in any race results of that period which means most likely track days. A stage 3 racing cylinder head, a Kent high lift cam shaft and a performance exhaust was removed by a following owner GP of Nottingham to enable the car to drive well on the road. The car still has a 7/8” heavy duty anti roll bar fitted to improve handling and steering whilst cornering at speed. I have just replaced all the selectors in the gearbox due to being heavily worn causing a very sloppy gear stick. Most likely as a result harsh gear changes during races etc. Fortunately the gears look in good condition with no visible damage – and sound good with no noise when driven. Would be good to be able to track down some pictures of the car in it’s “former glory”. May even be tempted to try a track day myself – looks fun.